Data released by the Internal Revenue Service shows the Land of Lincoln could be in big trouble. The Land of Lincoln is experiencing heavy losses of people and income to other states, new IRS data reveal. 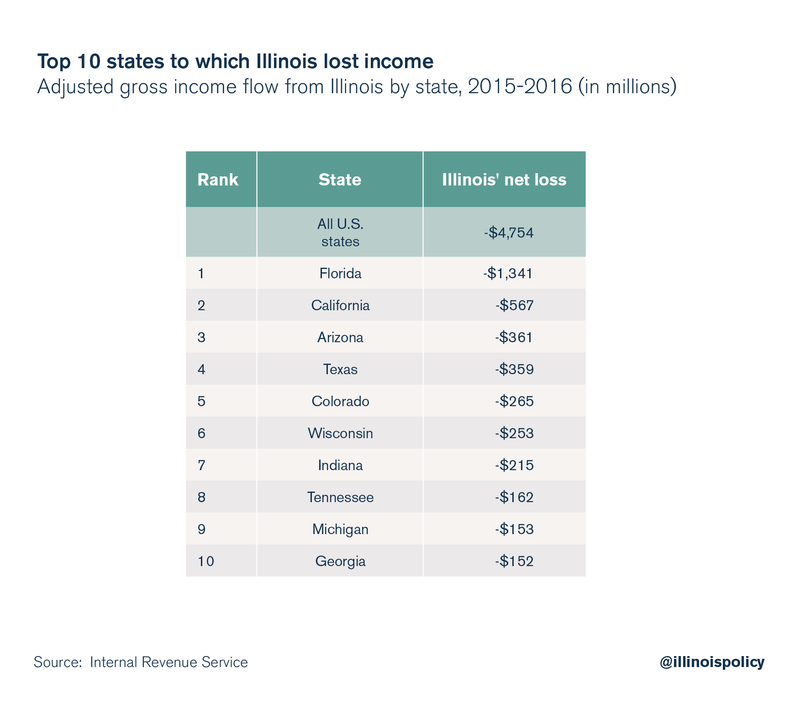 Illinois lost more than 86,000 people and $4.75 billion in adjusted gross income to other states from 2015-2016. Illinois’ problem with wealth flight isn’t just persisting, it’s getting worse. That’s the takeaway from new data released by the Internal Revenue Service on Nov. 30. In terms of both people and income, the Land of Lincoln saw a record-breaking exodus in the 2015 tax year (2015-2016). 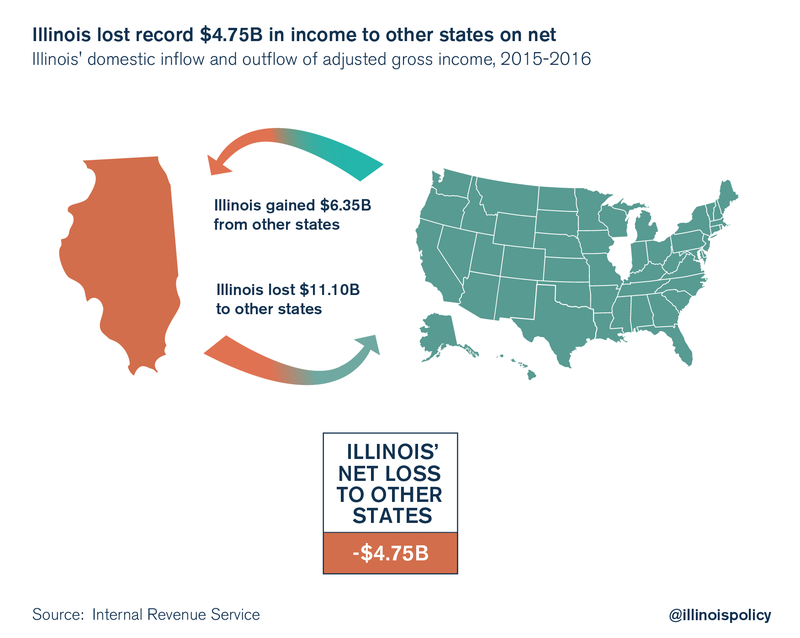 Illinois saw a net loss of nearly 42,000 tax returns to other states on the year, representing a net loss of more than 86,100 people (measured in exemptions), according to the IRS. That’s an all-time high. And when people leave the state, they don’t just take their talent, drive and ingenuity. They take their wallets, too. 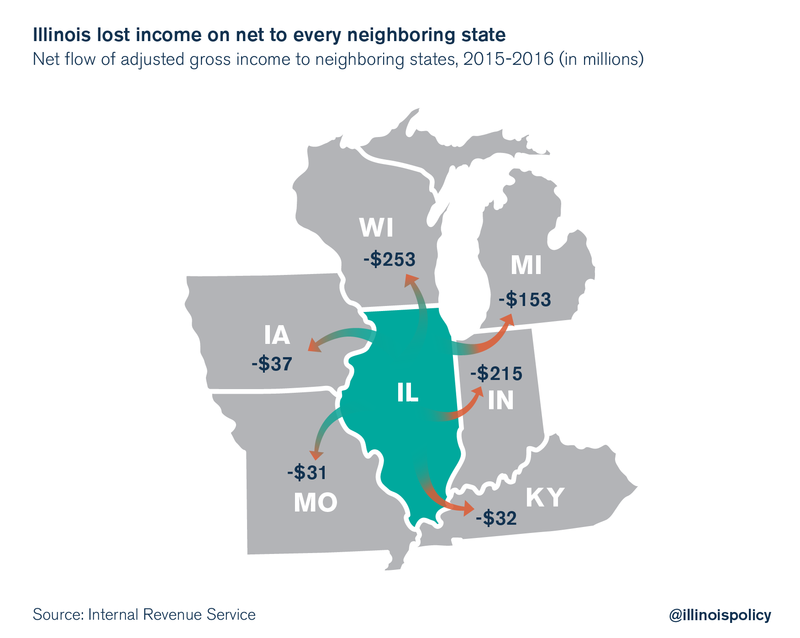 Illinois lost $4.75 billion in adjusted gross income, or AGI, on net to other states in tax year 2015. That’s also an all-time high. While residents saw $6.35 billion in AGI move into Illinois from other states, $11.10 billion moved out of Illinois to another state. It’s not retired snowbirds who are driving the flight from Illinois. Analysis of IRS data for previous years shows how millennials are in fact leading the Illinois exodus. Further, the most recent IRS data show Illinois lost income and people on net to every neighboring state. It’s not just the weather. To where exactly are people walking? 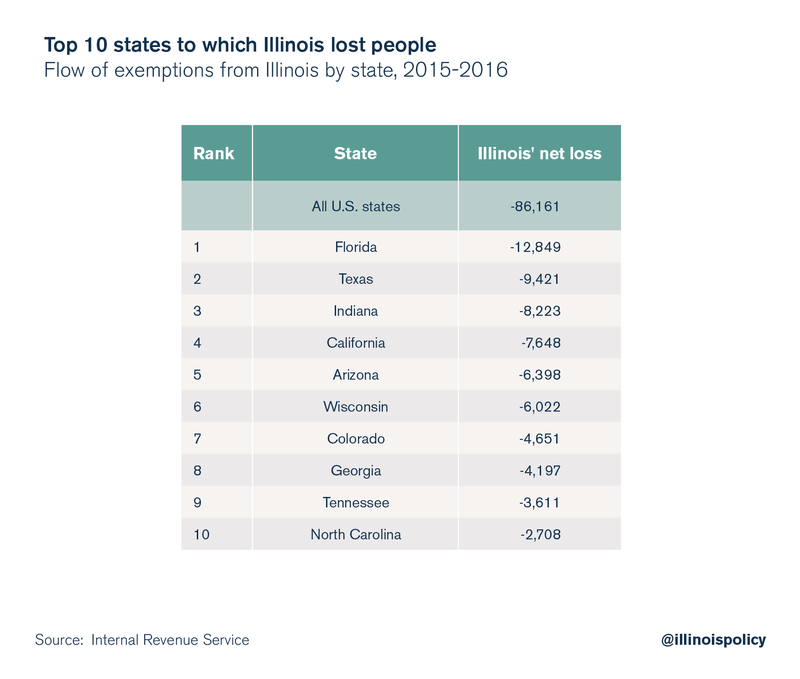 The top 10 states to which Illinois lost people were: Florida (12,800 exemptions gained from Illinois on net), Texas (9,400), Indiana (8,200), California (7,600), Arizona (6,400), Wisconsin (6,000), Colorado (4,700), Georgia (4,200), Tennessee (3,600) and North Carolina (2,700). Since the 2011 temporary income tax hikes, the flight of wealth and people from Illinois has accelerated. This consistent, worsening trend is an indictment of the policy status quo in Illinois. A 2016 Paul Simon Public Policy Institute poll found Illinoisans cited taxes as the No. 1 reason for wanting to leave the state. And while Illinois’ temporary income tax hike partially sunset at the start of 2015, left to run wild was the largest tax Illinoisans pay: property taxes. Illinoisans shoulder the heaviest property tax burden in the nation, according to a 2016 study from real-estate services company CoreLogic. Yet for years, Springfield has rejected any substantial reforms to address the cost-drivers behind those property tax bills: the highest number of local governments in the nation, skyrocketing local pension costs and an unfair bargaining regime that stacks the deck against taxpayers in negotiations, to name a few. Proposals for a hard property tax cap have been rebuffed as well. Of course, taxes aren’t the only reason people are leaving. The state’s laggard economy, evidenced by legions of Illinoisans dropping out of the workforce altogether, is another likely culprit. This Illinois Policy article was republished with permission.